It was the night Robert’s Western World from Lower Broadway Nashville descended onto a small music venue in the back streets of Leicester city centre. This may be stretching the imagination a little in terms of literal translation, but the spirit of the honky tonk was alive and kicking in the stage act of Sarah Gayle Meech at The Musician. Fresh from her residency at one of Music City’s premier night time tourist attractions, and on the back of cutting her second record, Sarah Gayle has jumped at the opportunity to export her bold and brash style of country music overseas. 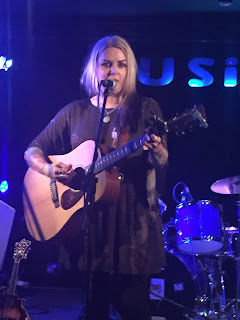 The British part of this European adventure mainly sees her talents captured by the nation’s northern club scene; although there was added excitement as she ventured south to illuminate one of the Midlands established listening venues for touring Americana and country acts. To phrase a couple of words from the modernist vocabulary, Sarah Gayle was ‘stoked’ and ‘hyped’ to be playing a stage previously graced by Dale Watson and Eileen Rose as well as treading the boards a little more than a week before Jason and the Scorchers hit town. By now you should be getting the image that Sarah Gayle has her feet firmly planted in the field of country music that is not the flavour of the day for mainstream genre movers and shakers. To this extent, she is emerging as a key player in the Ameripolitan movement and is the latest recipient of the Female Outlaw of the Year Award from that organisation. For nearly two hours on this July evening, a highly respectable Sunday night crowd was wooed by a performer brimming with confidence, high on impact and a staunch traditionalist with an incumbent heart-on-sleeve attitude. Enthusiastically supported by a small section of the gathering determined to embrace the sentiment of the show, Sarah Gayle gave a glimpse of what encompasses a Nashville residency with a pair of sets packed full of classic covers and a raft of originals with more than a hint of influence from the golden age of country music. 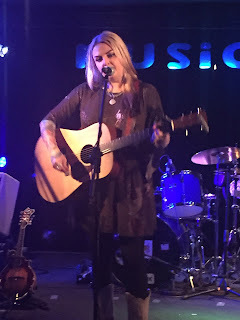 Although Sarah Gayle embarked on this adventure as a solo performer, she has hooked up with a British band which had little trouble easing her through the country songbook with their smart playing led by fine lead guitar and excellent pedal steel. Sarah Gayle exuded an incredibly strong persona to put every inch of personal sinew into her stage performance which is what is probably needed to hold your own in many establishments back home. The result was a unique show for this country and one filled with immense pleasure from the opening strains of ‘Heartaches by the Number’ to a closing rendition of the George Jones favourite ‘White Lightning’. There is a fine line in credibility circles between the subtle and overindulgent use of cover versions. Sarah Gayle skirted this line with a string of very familiar old favourites from artists such as Merle Haggard, Loretta Lyn, Patsy Cline, Hank Williams and Waylon Jennings, but kept to the right side in attempting to re-create the authenticity of a demanding residency right in the heart of the country music capital. However Sarah Gayle is far more than an interpreter of music, as has been evidenced in her two outstanding original albums to date. TENNESSEE LOVE SONG is the latest release and a prime reason for undertaking this tour as a promotional tool, although the songs from her debut record ONE GOOD THING had the more lasting appeal upon reflection after the show. This 2011 release is the earthier of the two records and from its grooves, ‘Little White Boots’, ‘All I Want is a Honky Tonk’ and ‘Honey Put Your Money Where Your Mouth is’ were amongst the highlights of the show. It seemed that the tracks from this record were more prevalent in the set list with ‘Tennessee Love Song’ and ‘Watermelon and Root Beer’ leading the way from the new album. Sarah Gayle selected a couple of older original numbers to play during the mid-set segue where she played a string of acoustic numbers while the band had a breather. ‘Foolish’ and ‘Unlucky in Love’ from the older record were incorporated into this segment. Originating from the Pacific North West region, an area not normally know for country music but still the original home of a couple of today’s outstanding performers in Brandy Clark and Zoe Muth, Sarah Gayle cut her musical cloth in the Californian scene prior to locating to Tennessee. This West Coast influence extended into celebrating the work of two iconic performers who made their name in that area, namely Buck Owens and Dwight Yoakam. Whether belting out old favourites or promoting her own work, Sarah Gayle bestowed an air of consistency to the proceedings and this fuelled an incredibly enjoyable gig which began with the chosen support for the evening. Josh Chandler Morris and Carly Slade are an English duo from Milton Keynes who straddles their act at the point where country music merges more into a folk Americana sound. Their thirty minute slot was packed with impressively constructed songs, strong on melody and delivered from a pair of finely tuned vocalists. They varied the delivery between occasional individual solo efforts and the more widely used harmony mode. Josh’s acoustic guitar was the main musical accompaniment with Carly’s couple of banjo pieces adding a traditional element to their sound. The superb ‘Who’s Gonna Hold Your Hand’ and the gospel piece ‘Angels in Heaven’ were among the set’s highlights and are featured on the duo’s single release. They are certainly an act worth checking out on the circuit. It was a delight to host Sarah Gayle Meech at a Midlands venue and she confirmed previous listening promise as an artist who can make an enormous impression with their live presence. She proved to be the real deal and extremely accomplished in the style of country music close to her heart and core to her mission. If this journey continues to have the UK on its horizon then many folks over here are going to be happy people and Sarah Gayle Meech can continue to carve out an increasing level of recognition.